thanks for the plug! 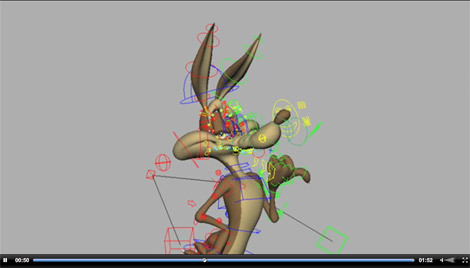 just to note, those rigs had varying levels of controls and visibility options, so animators could speed up the rig based on how detailed deformations they wanted to see. the faces by far had the most amount of slow down in the rigs, but again – giving them control to turn things off in order to work fast was key. i encourage everyone to frame by frame through the shorts to see what kind of craziness the animators did with these rigs… literally matching the smears and multiples from the old shorts. thanks for the infos Josh and good thing you are also crediting the rest of the team as we tend to forget that production is often a team effort, with everyone contributing to the final result in varying degrees. Yep those multiples are pretty crazy, I hope you soon explain how this was done.